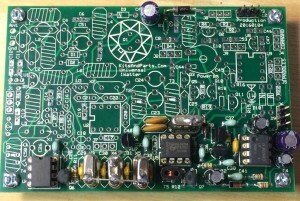 I finished phase 4 of the online 1-watter build-a-thon, the IF XTAL filter. First, I made a modification to the capacitors in my XTAL checker, as not all my 6mhz crystals in this kit were oscillating using the default values. The checker probably still isn’t perfect, and more modifications may be required. For $7, I’m not going to complain. It does the job and will be useful in the future. This build phase was straight forward and fairly simple. No toroid cores to wind, no odd components to find, and only one resistor to search for. I took my time and the hardest part was making sure not to overheat and ruin the crystals in the filter when I grounded the cases. The test for phase 4 seems to work. Not a whole lot to test yet, but I do get a bit of fuzz out the audio out when I touch the mixers input pins. Thankfully the 2khz tone I wrote about from my phase 3 testing went away. My board is now giving a tone just under 1khz. This is exactly where it’s supposed to be. I suspect it may have something to do with modifying the XTAL checker, but I did build a whole extra section, so who knows? One quick and easy way to check tone pitch is to use a free instrument tuner program on a smart phone. I happened to already have one loaded, and it saves time and effort over plugging in a computer and running analysis of the audio.